La campagne agricole 2016-2017 était globalement satisfaisante, avec une production céréalière supérieure à la moyenne quinquennale de 17,5%. Cependant, de légères diminutions ont été enregistrées au Libéria (-7,5%) et en Mauritanie (-1,2%). La production de tubercules a augmenté de 10% par rapport à la moyenne de cinq ans. La production hors saison et de jardinage a fonctionné de manière habituelle, soutenue par une bonne disponibilité globale de l’eau de surface pour la saison. Ces cultures vont compléter les stocks alimentaires des ménages. The pastoral situation, pasture and watering conditions of livestock are average to satisfactory despite fodder deficits registered in a large part of the Sahelian belt notably in Burkina Faso, Mali, Mauritania, Niger and Chad. 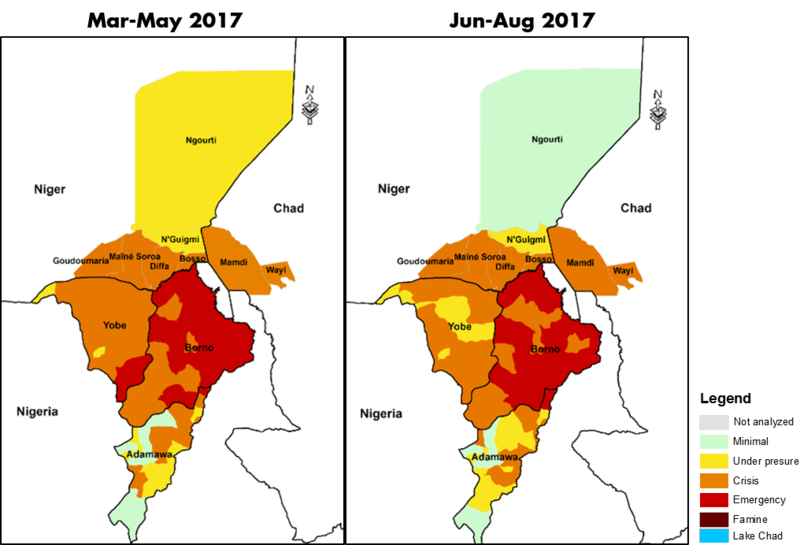 Transhumance movements remain normal except in the fodder-deficit areas and conflict zones, especially in the Lake Chad basin, northern Mali and northwest Niger. The significant decrease in the terms of trade for herders is having a seriously impact on access to food for pastoral populations in Niger, Tchad and Nigeria. According to the Cadre Harmonisé analysis around 9.6 million people need humanitarian assistance, among whom 8.2 million are in crisis, 1.4 million are in emergency and 44.000 are in famine. 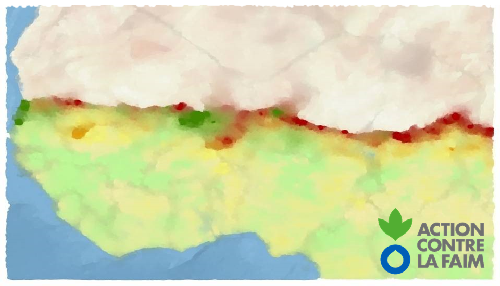 Market functionality is satisfactory except in the Lake Chad basin due to civil insecurity. 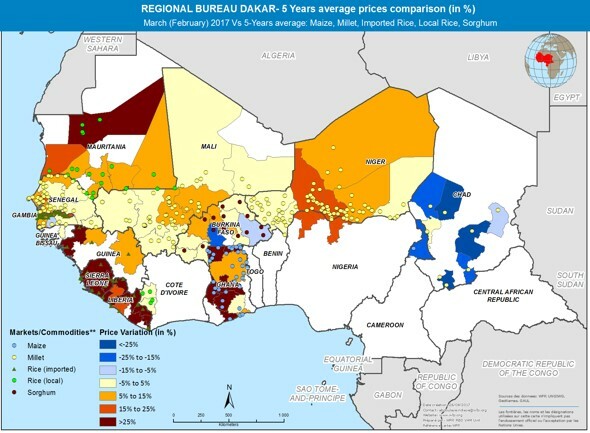 Cereals prices have started to increase significantly in Niger, Mali and Mauritania compared to the 5 year averages. Livestock prices for cattle and small ruminants are generally decreasing in the region due to the decrease in demand from Nigeria which affects herders purchasing power. The depreciation of currencies in Nigeria, Liberia, Sierra Leone and in Ghana, as well as the civil insecurity around the Lake Chad basin, constitute the principal factors affecting prices and flows between countries. In the East basin, this situation has caused a reversal of flows of cattle, poultry, onions and other cash crops between Nigeria and Niger. The 2016/2017 Agro-Pastoral campaign marks a considerable deterioration from last year’s favorable situation. The onset of the dry season in Niger has been met with an acute forage deficit. 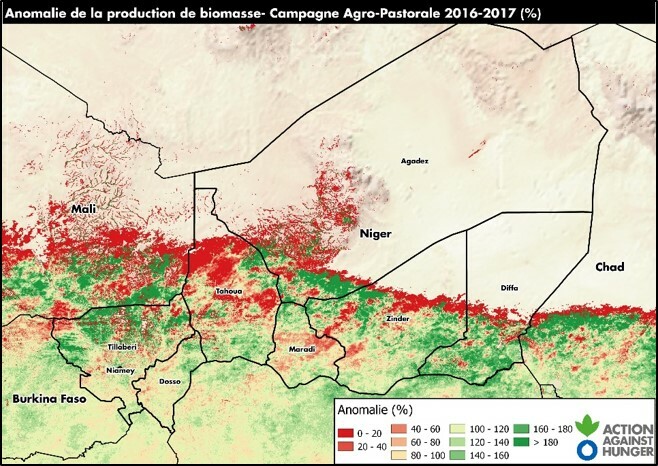 Predictions made in October have been confirmed by reports from the Nigerien Ministry of Livestock, OCHA and ACF field data. The lack of available pasture land is putting significant pressure on pastoral communities and there is an urgent need for animal fodder distribution. Moreover, the strong decrease in livestock’s prices and the rise of cereals’ prices has greatly deteriorated the terms of trade for herders in already fragile areas and is causing strong concerns regarding the ability for the affected population to assure their food and nutritional security. The key areas which have been identified as the most affected are Tahoua (Tchintabaradene), Maradi (Mayahi), Zinder (Tanout). 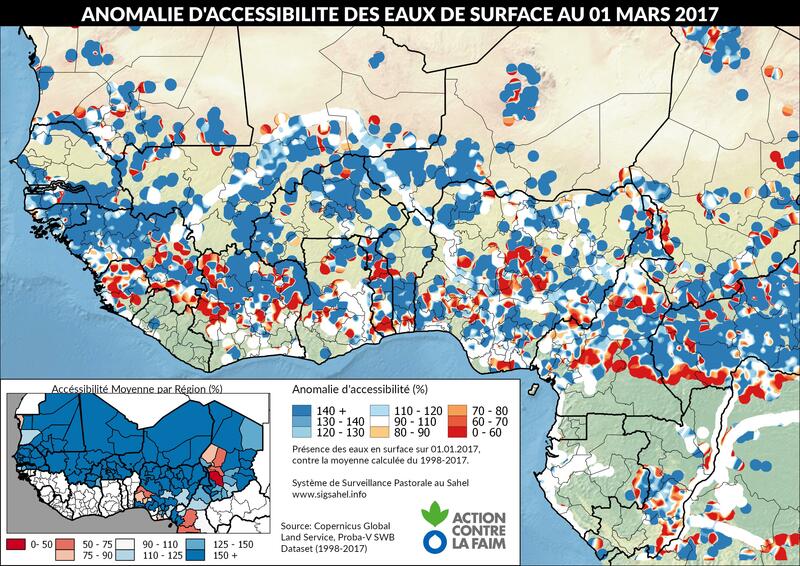 Surface water occurrence remains normal or favorable across the Sahel. The distribution of current lakes with a surface over 1km² is above the long-term average. That said, conditions remain less favorable then last year’s agropastoral campaign. Conflicts and violence have caused the displacement of more than 4.9 million people, out of which 2.4 million are in the LCB areas (source: OCHA). Despite a massive scale-up of humanitarian interventions in North-East Nigeria and the liberation of some LGAs the situation remains critical and current efforts should be maintained in order to support severely food and nutrition insecure populations. It is estimated that around 43.000 people are currently in famine and this figure will most probably increase during the lean season. According to UNICEF, 1.2 million children under 5 years will suffer from acute malnutrition in the LCB area over 2017 and more than 540.000 will need immediate treatment. north of Mali and in the three northeastern Nigeria States due to the deterioration of living conditions and persistent civil insecurity. In refugee and IDP areas, as well as host communities’ areas, the situation is much more alarming with prevalence above the emergency threshold. 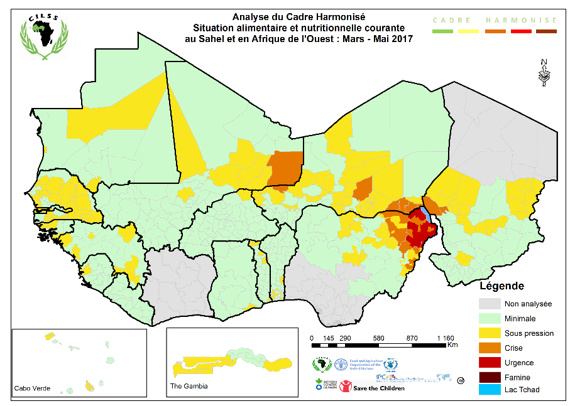 The nutritional situation could deteriorate during the lean season in most of the Sahel countries. According to UNICEF, 8.6 million children will suffer from acute malnutrition in the Sahel in 2017 and 3.3 million from its most severe form. 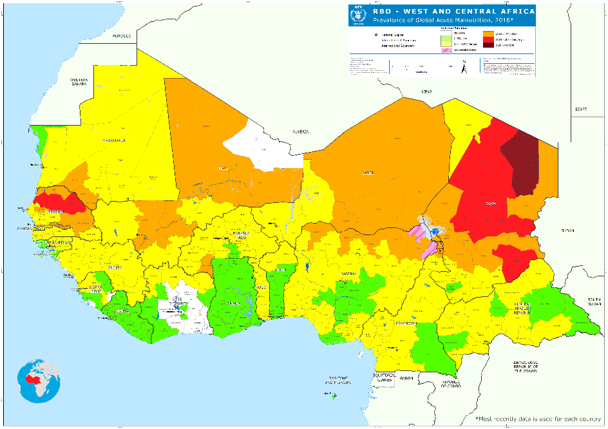 Currently, strong risks are seen in Senegal, Mauritania, Mali, Niger, Nigeria, Cameroon and Chad. Fournir des aliments pour animaux immédiats aux éleveurs dans les zones de Tahoua, Maradi, Zinder au Niger. De près le cours de la fluctuation au Niger, au Mali et au Tchad et se préparer à réagir rapidement en cas de besoin. Suivre le développement du pipeline RUTF par rapport à l’admission au Niger et au Mali, où le nombre prévisionnel de cas d’enfants SAM assemble assez sous-estimé. Continuer à promouvoir les fonds pour répondre aux besoins énoncés au Nigeria du Nord-Est sur la base des engagements de la conférence d’Oslo.